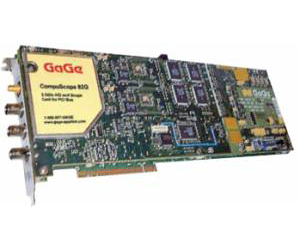 CompuScope 82G is a single slot, PCI bus card capable of performing 8 bit A/D conversion at sampling rates up to 2 GS/s in one-channel mode and 1 GS/s in dual channel simultaneous mode. The CompuScope 82G uses two monolithic A/D converters each running at 1 GS/s. In single-channel mode the two ADCs are clocked in a "ping-pong" mode to achieve up to 2 GS/s sampling. In dual channel mode, the two ADCs are clocked absolutely simultaneously to provide coherent sampling.